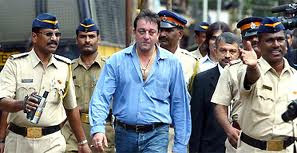 Film actor Sanjay Dutt was sentenced to 5 years in jail by the Supreme Court for his role in the 1993 Mumbai serial blasts. He has one month to surrender.He was sentenced to a jail term of six years for illegal possession of firearms acquired from terrorist acquaintances on July 31, 2007.He was granted bail by the apex court on November 27, 2007. The Bollywood actor was first arrested on on 19 April 1993 under the Terrorist and Disruptive Activities Act (TADA). He spent 16 months in jail until he was granted bail in October 1995 by the Supreme Court of India. He was later re-arrested in December 1995 and re-released in April 1997 once again on police bail terms. 0 Response to "Sanjay Dutt Sentenced 5 Years Jail in 1993 Mumbai Blasts Verdict"